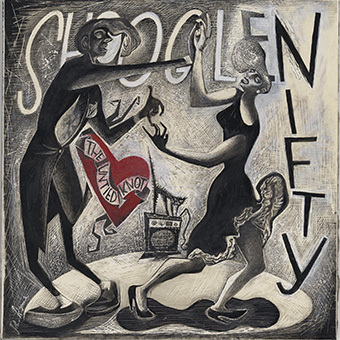 This is Shooglenifty’s seventh studio album, and the first to feature a collection of songs. The breathtaking ‘puirt a beul’ (mouth music) of Gaelic vocalist Kaela Rowan brings a captivating and energising new element to the band’s sound, and further confounds any attempt to categorise them. The Untied Knot drops additional pins in the Shoogles’ map of international influences, this time hitting the road from Scotland to Rajasthan. Watch out for James Mackintosh and Kaela Rowan’s The High Road To Jodhpur, a tune that makes that connection explicit, whilst Burns’s Tam o’Shanter is the ‘closer to home’ inspiration for the title track by Quee MacArthur. Former band member Luke Plumb’s fresh compositions – the psychedelic Arms of Sleep and The Highway Carpark, a ‘hurry up and wait’ classic – are included, whilst new mandolin player Ewan MacPherson makes his mark with three tunes. His Somebody’s Welcome To Somewhere, a tongue-in-cheek Highland march, features the princely pipes of a guesting Ross Ainslie. Ewan also contributes a dark nautical romp The Devil’s Breath Hornpipe, and speedy pair of reels clearly spawned by the Shoogle dance gene: Samhla Reel/Scolpaig. A dazzling contribution by Garry ‘Banjo’ Finlayson, The Scorpian (sic) is a fascinating and enigmatic creature, whilst Fitzroy’s Crossing, the striking Antipodean closing track by Shooglenifty front man Angus R Grant, is proof positive that there is no musical journey this band can’t take.